This article describes another group of early companies which merged in 1873 to form the Eastern Extension company. Having linked India to the UK, John Pender now went ahead with a scheme to link Australia to England. The first stage was the laying of cables from Madras to Penang and from Penang to Singapore, both of which were laid in 1870. Telcon once again obtained the order for the cable and laid the first of the above using CS Scanderia and CS Edinburgh, the distance being 1408 nm. The second, 400 nm long was laid by CS Scanderia and CS William Cory. A landline linked Bombay and Madras. D. Shore End, 1834 Miles, Singapore & Penang. 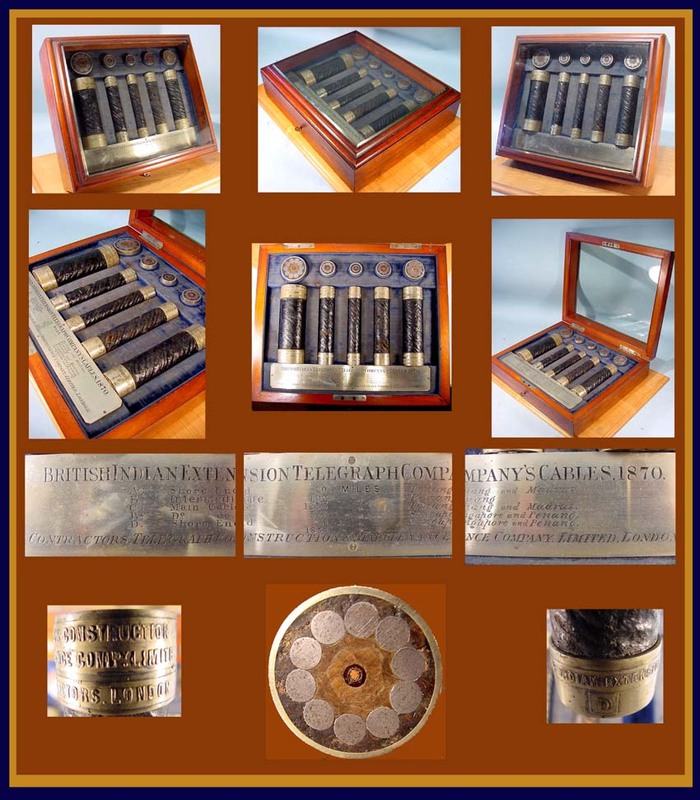 This John Pender company was formed in 1870 to lay the final stage to Australia. A 557 nm cable was laid from Singapore to Batavia by CS Hibernia in 1870, and in the following year CS Hibernia and CS Edinburgh laid the 1082 nm cable from Banjoewangie to Darwin, Australia. Batavia and Banjoewangie, situated at either end of the island of Java, were linked by landline. At Darwin the cable linked with the Overland Telegraph to Adelaide. The Overland Telegraph Line is in the foreground. Dated 1901 in the text. 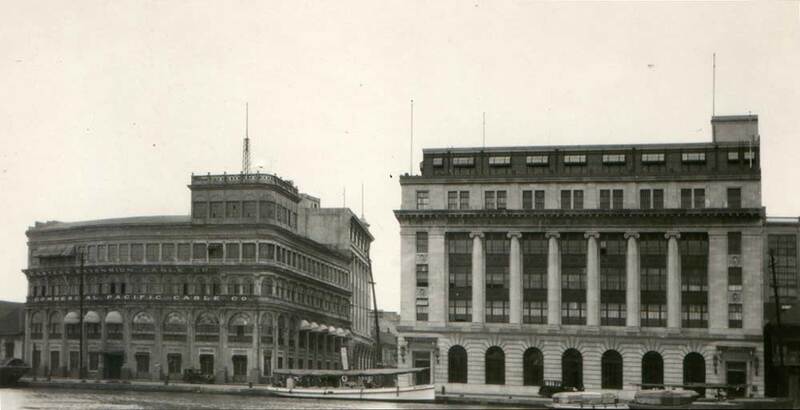 This was another Pender company set up to link Hong Kong into the growing network. Telcon manufactured the cable and used CS's Agnes, Kangaroo, Belgian and Minia to lay the cable from Singapore-Saigon-Hong Kong. The work took place in 1871. 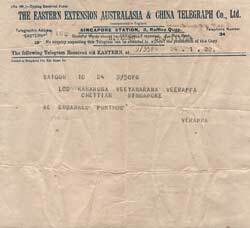 In 1873 the above companies merged to form the Eastern Extension, Australasia and China Telegraph Company (EEAC). The first major undertaking by the new company was in 1876 when a 1283 nm cable from Sydney to Wellington, New Zealand, was laid by CS Edinburgh and CS Hibernia. After completion CS Edinburgh remained as repair ship. 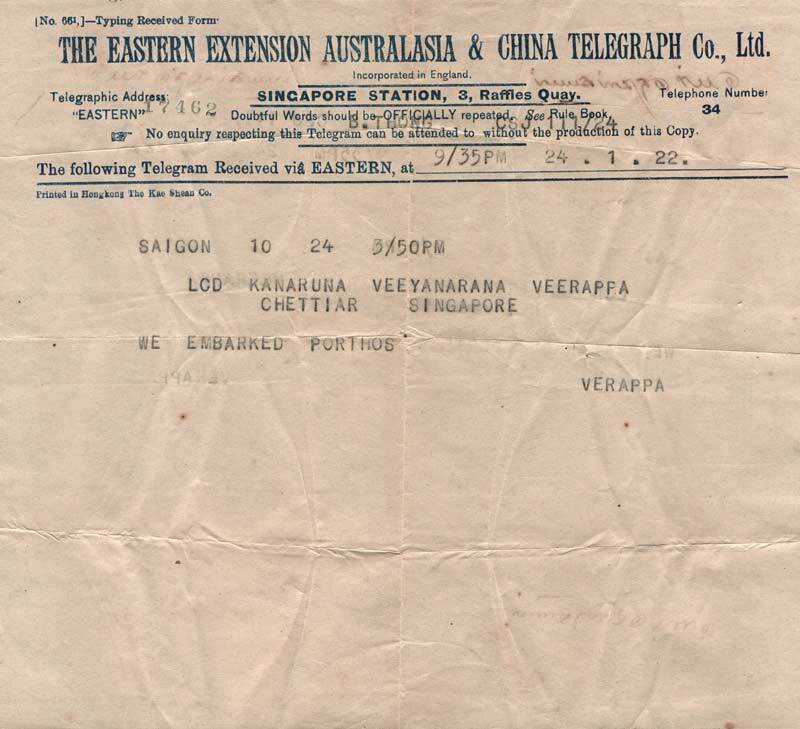 CS Investigator, repair ship for the British-Australian company, was transferred to the West Indian and Panama Telegraph Company and CS Agnes formerly belonging to the China Telegraph Company also remained on repair duties. A duplicate cable over this route was laid by CS Scotia in 1890. 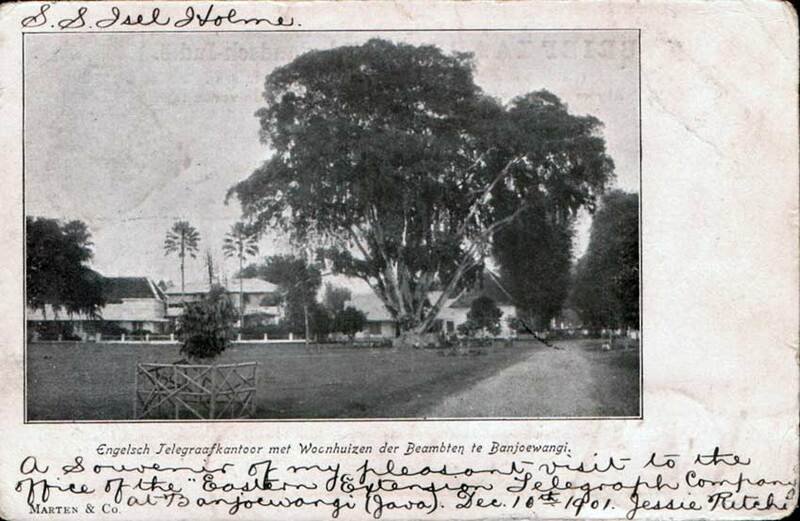 Rangoon, Burma, was connected to Penang in 1877 by CS's Hibernia and Kangaroo with landlines being constructed to connect Madras to Rangoon. 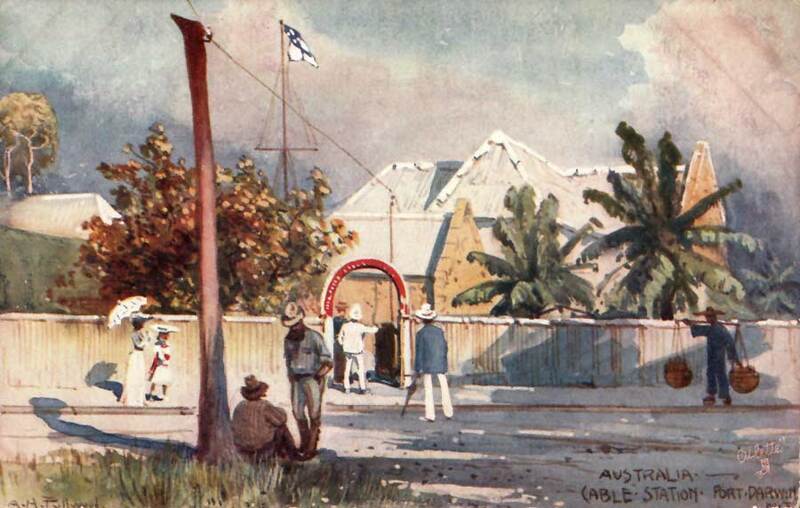 A duplicate cable from Singapore to Darwin was laid in 1879, but this time the only landing on Java was at Banjoewangie, eliminating the landline across the island. CS Scotia and CS Edinburgh laid the Singapore-Banjoewangie section and CS Seine and CS Edinburgh the link to Darwin. Also in the same year a duplicate cable was laid from Penang to Singapore, this time with a landing at Malacca. CS's Scotia and Edinburgh carried out the laying. 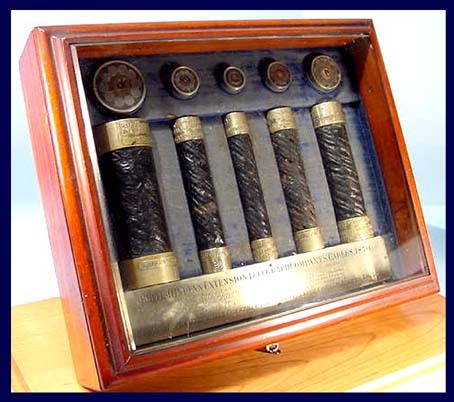 1880 saw a 535 nm cable being laid from Hong Kong to the Philippines using CS Calabria. 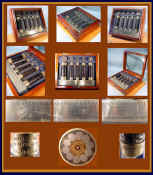 A number of cables were laid between the Philippine islands using CS Sherard Osborn and CS Recorder (1) during 1897-9. 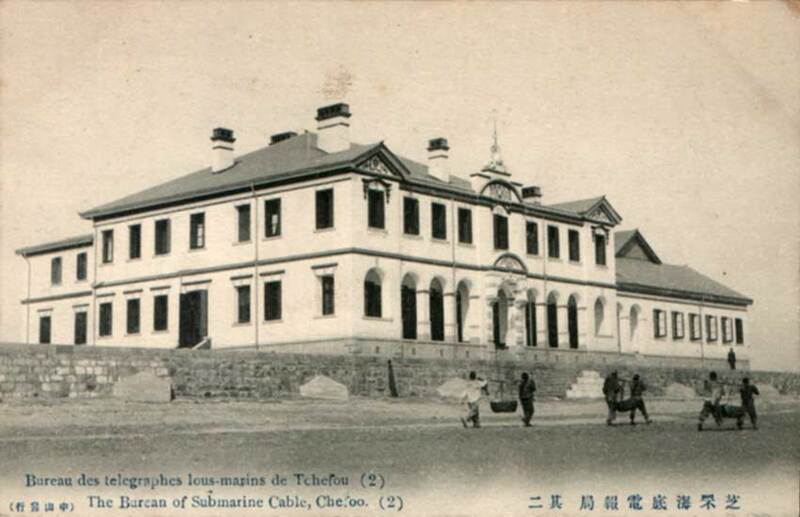 In 1883 CS Scotia extended the cable from Hong Kong to Shanghai with a landing being made at Foochow. 1884 saw another cable from Singapore to Hong Kong, this time with landings at Tonkin. This section was laid by CS Sherard Osborn, and the Tonkin-Hue-Saigon-Hong Kong section by CS Calabria and CS Kangaroo. 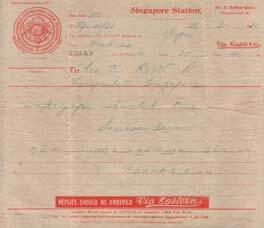 Sherard Osborn also laid a 35 nm cable from Hong Kong to Macao. In 1891 Penang was connected to Medan, Sumatra, by CS Recorder (1). In 1894 a different route was followed between Singapore and Hong Kong, this time with a landing at Labuan, North Borneo, the 2002 nm cable being laid by CS Scotia. In 1895 new offices were opened on Raffles Quay in Singapore. See this page for a contemporary news account of the opening and a description of the facilities. 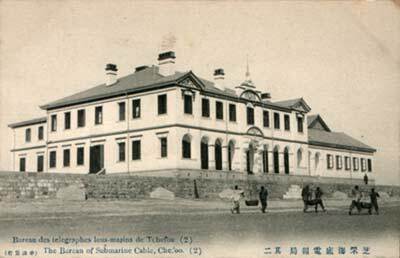 "The Bureau of Submarine Cable, Chefoo"
When it became clear that the Pacific cable would go ahead the EEAC decided to improve its service to Australia. It leased land on Direction Island from the Clunies Ross family, building a cable station on the site. The new cable route was Durban-Mauritius-Rodriguez Island-Cocos-Perth and Adelaide. The cable from Durban to Mauritius had been laid in 1901 by CS Anglia for the ETC and CS Anglia also laid the Mauritius-Rodriguez-Cocos cables 417 nm and 2157 nm respectively. All were laid in 1901-2. The cables Cocos-Cottesloe (Perth)-Glenelg (Adelaide), 1721 nm and 1525 nm respectively, were laid by CS Scotia. From Durban a landline linked it to Cape Town and then the telegrams were transmitted via the cables laid in 1899-1901 from Cape Town via St. Helena, Ascension and the Cape Verde Islands. 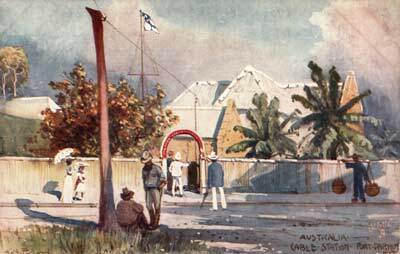 Two further cables were laid in this area, Cocos-Batavia in 1908 by CS Patrol; in 1926 CS Colonia laid a duplicate cable from Cocos to Cottesloe. The Cable Station, Cottesloe Beach, W.A. 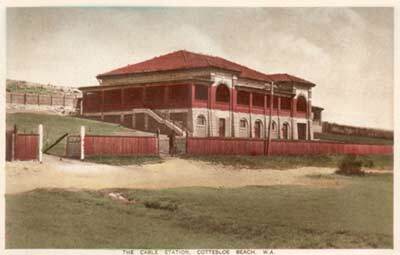 Site visitor Dr Paul Weaver has recently made observations about artifacts exposed by storms at the Cottesloe Cable Station site. Paul has the story and photographs on his Live Journal. 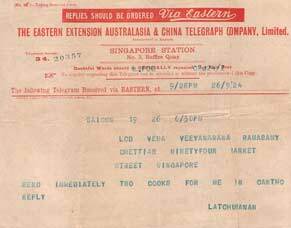 A cable linking Aden-Colombo, Ceylon-Penang-Singapore-Hong Kong was laid in 1914 using CS Colonia. 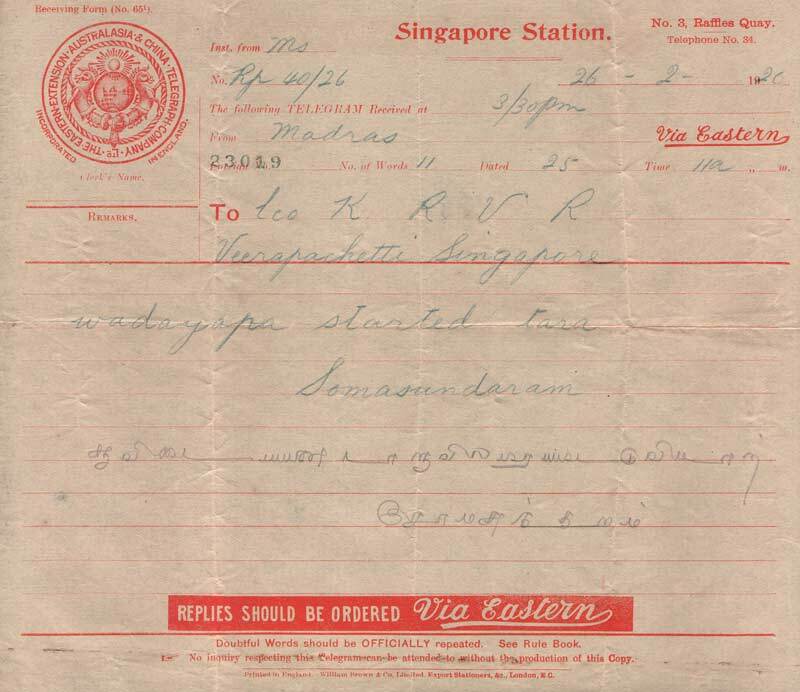 In 1922 CS Patrol laid a cable from Singapore to Batavia. Non-compete agreements, which are strictly prohibited under today's business laws, were quite common in the earlier days of the telegraph industry. 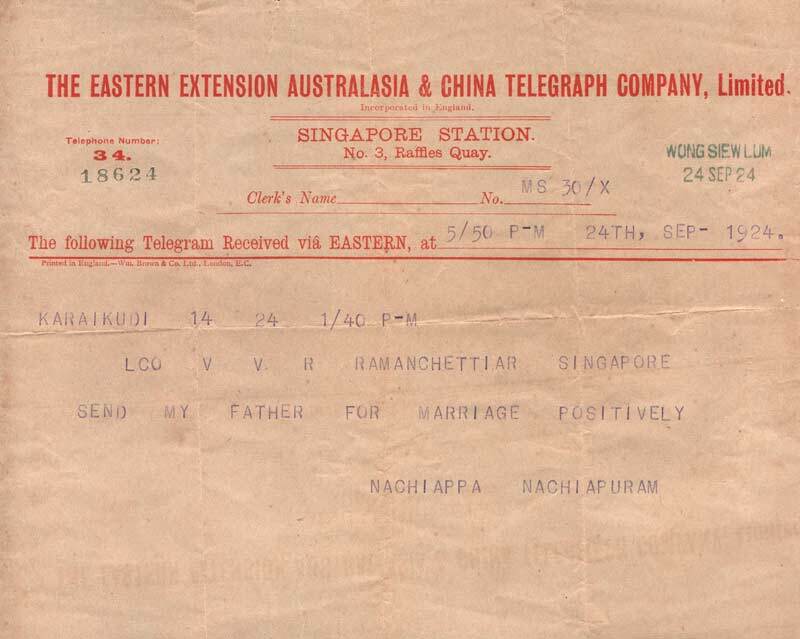 This 1904 agreement between the Eastern Extension, Australasia and China Telegraph Company, Limited, and the Deutsch Niederländische Telegraphen Gesellschaft, Aktiengesellschaft would have been typical. 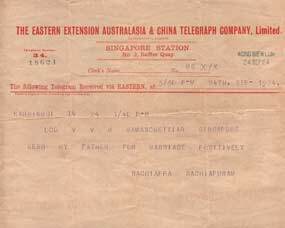 An Agreement made this 26th day of July, 1904, BETWEEN THE EASTERN EXTENSION AUSTRALASIA AND CHINA TELEGRAPH COMPANY, LIMITED, of London, England (herein after called the Extension Company), of the one part, and the DEUTSCH NIEDERLÄNDINDISCHE TELEGRAPHEN-GESELLSCHAFT, AKTIENGESELLSCHAFT, of Cologne, Germany (hereinafter called the German Dutch Company), of the other part. 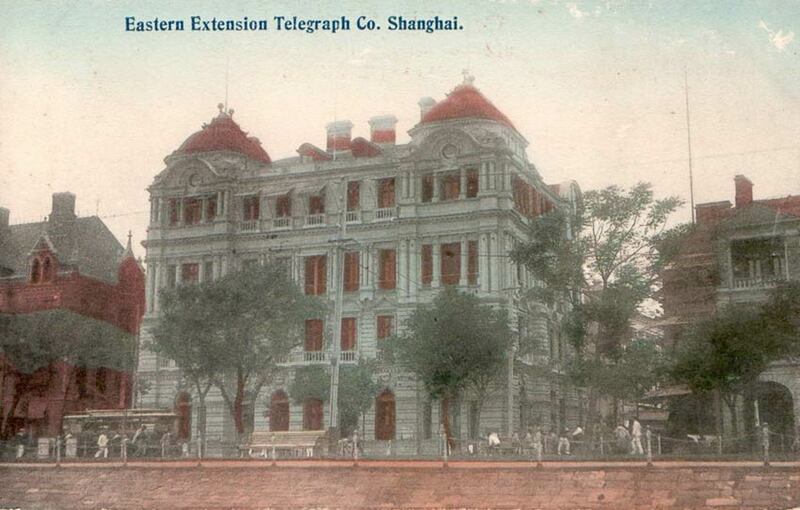 WHEREAS the Extension Company, in connection with the Imperial Chinese Telegraph Administration (hereinafter referred to as the Chinese Administration), the Eastern Telegraph Company, Limited (hereinafter called the Eastern Company), the Indo European Telegraph Company, Limited (hereinafter called the Indo Company), and the Great Northern Telegraph Company, Limited, of Copenhagen, Denmark (hereinafter called the Northern Company), has established and for many years past has operated lines of submarine telegraph cables and landlines connecting Europe with Japan, Korea, China, Hongkong, Macao, the Philippines, and other parts of Asia. AND WHEREAS the Extension Company claims to hold exclusive rights by virtue of concessions granted by the Spanish Government, dated the 14th day of April, 1897, and the 30th day of March, 1898, for the landing and working of submarine cables in the Philippines, Ladrones, Carolines, and other islands in the Pacific Ocean, and has agreed, so far as it legally may, hereby to consent; to the German Dutch Company landing and working submarine cables at Guam and Yap. AND WHEREAS the Northern Company has certain rights in China, and the Extension Company has also agreed to aid the German Dutch Company in obtaining landing rights, on the terms hereinafter expressed, at Shanghai, through the Northern Company. 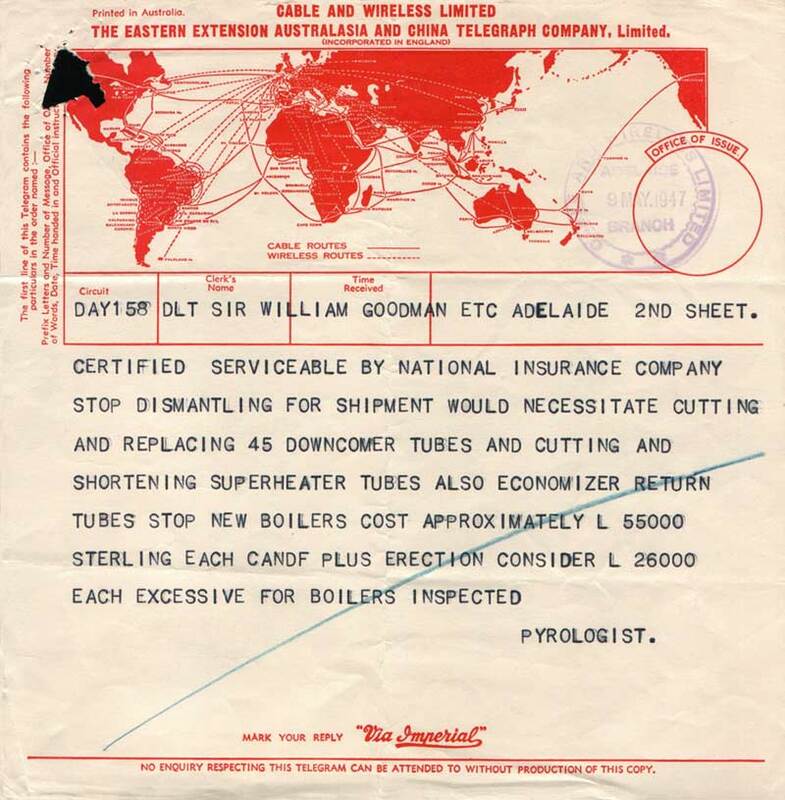 AND WHEREAS the German Dutch Company has been formed for the purpose, inter alia of constructing, owning, working and maintaining a line of submarine telegraph cables from Shanghai to Guam, via, Yap, with branches extending, to the Dutch Indies and German New Guinea and other islands in the Pacific Ocean. 1. The German Dutch Company undertakes to obtain from the German and Dutch Governments respectively a written declaration to the following effect, viz. That they generally approve this Agreement and that for the term thereof no subvention or guarantee shall be given by them in money or in any other shape or form to any other Company for cables Laid for purposes of competing for traffic subject to this Agreement, provided that the cables of the parties hereto work as well as other cables laid and worked under similar conditions. 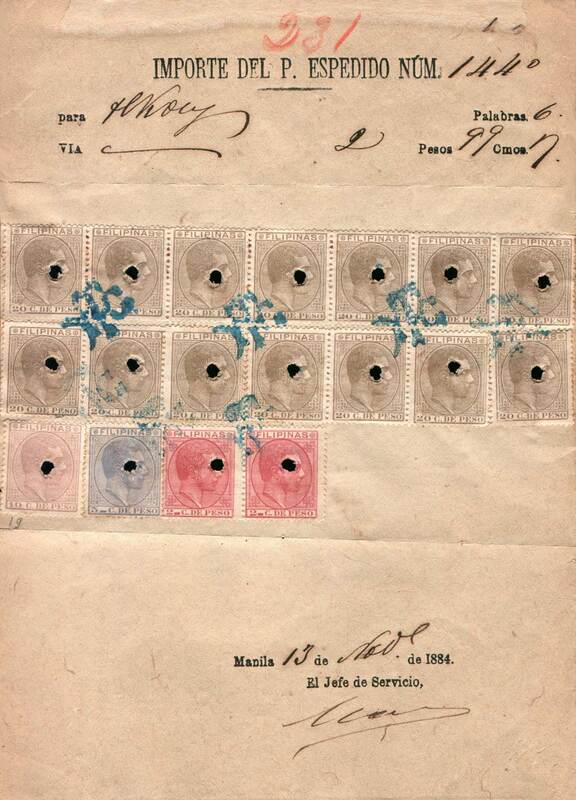 Provided also that, the Governments shall not be precluded from granting landing rights, but without giving to any other Company for cables laid for purposes as aforesaid any aid beyond what is required by the International Telegraph Convention and Regulations. The Governments reserve their right to work, on their own territory, by their own employees any cables landing there. 2. The Extension Company will obtain the consent of the Northern Company to the German Dutch Company landing, working and maintaining said line of submarine cables at Shanghai, and will use its best endeavours, and engage that the Northern Company will use its best endeavours, to assist the German Dutch Company in obtaining such landing permission from the Chinese Administration. PROVIDED ALWAYS, AND IT IS HEREBY EXPRESSLY DECLARED, that nothing this Agreement shall in any way prejudice or affect the rights of the Extension Company, Northern Company and German Dutch Company, to work and maintain their cables, or to lay, work, and maintain any duplications thereof, or to otherwise develop their systems, but without thereby increasing their share in the traffic receipts the subject of this Agreement as defined in Article 5. Provided always that the message receipts of the traffic the subject of this Agreement shall. under any circumstances, be included in the said traffic receipts. 3. The German Dutch Company will, with, all convenient speed after obtaining the consent of the Chinese Administration and of the Northern Company, establish, work and maintain a submarine telegraph cable from Shanghai to Guam, via Yap. 4. So soon is the said line of submarine cables shall be laid and opened for traffic between Shanghai and Guam via Yap, each of the parties hereto shall transmit with all practicable despatch and regularity all messages handed over to them for transmission. 5. 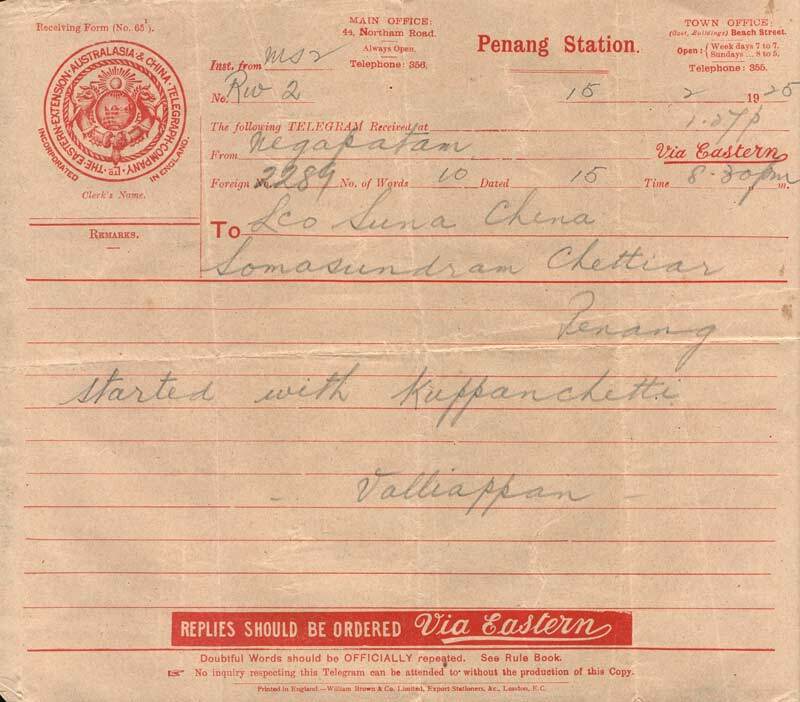 The German Dutch Company shall after the opening of the cable for traffic between Guam and Shanghai via Yap, pay annually to the Extension Company its total receipts less outpayments derived from traffic between Japan, Korea, China, Hongkong, Macao and the Philippines, on the one side, and Europe (not including Russian terminal traffic via the Northern and Indo European routes) and America (not including, the Hawaiian Islands) on the other, plus the sum of £27,500. In consideration of these payments the Extension Company will pay to the German Dutch Company in each calendar year, each year being taken by itself, and, a proportionate part being payable in respect to the period between such opening for traffic and the end of the current year, a sum equal. to 8.53 per cent. 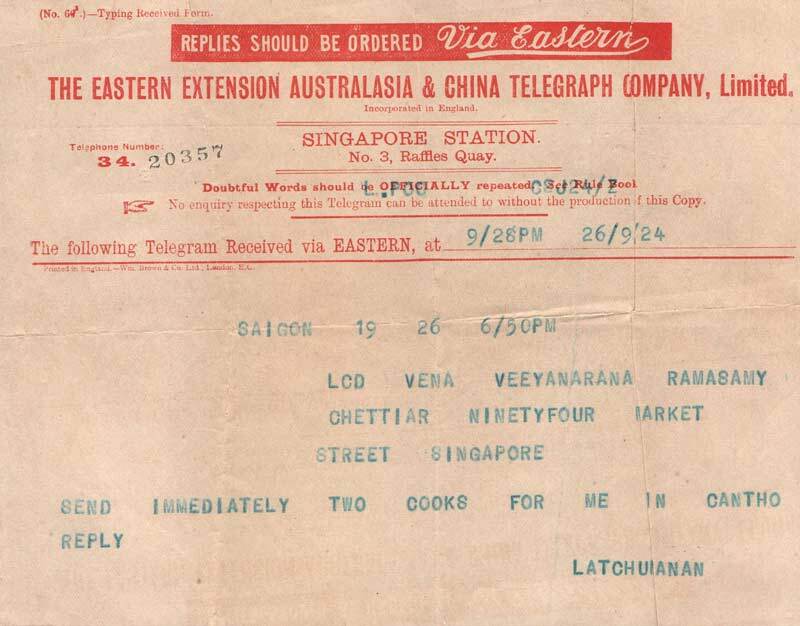 of the net receipts derived from such traffic by the Extension Company, the Northern, Eastern and Indo Companies, and by the Commercial Pacific Cable Company of New York. Provided always that the receipts of the German Dutch Company derived from the above percentage of 8.53 shall never be less than £38,500 during the uninterrupted working of its system and during the continuance of the rates specified in the Schedule referred to in Article 7. 6. During any interruption of the German Dutch Company's system the provisions of Article 5 shall continue to apply for a period not exceeding nine consecutive calendar months. (a) After nine months' interruption up to eighteen months' interruption, the German Dutch Company shall pay to the Extension Company at the rate of one half of the £27,500 per annum, that is to say at the rate of £13,750 per annum, and the Extension Company shall pay the German Dutch Company 4.27 per cent. in lieu of 8.53 per cent. Provided always that the receipts of the German Dutch Company derived from the above percentage 4.27 shall never be less than at the rate of £19,250 per annum during such interrupted period. (b) After eighteen months' interruption up to twenty four months' interruption, the German Dutch Company shall cease to pay the said £13,750 to the Extension Company, and the Extension Company shall cease to pay any percentage to the German Dutch Company until the restoration of the German Dutch Company's cables. In the event of a total interruption of the German Dutch Company's system for a period of twenty four consecutive calendar months, the Extension Company may, by giving three calendar months' notice in writing to the other party, terminate this Agreement. 7. A Schedule shall be mutually agreed upon by the parties hereto specifying the first tariffs (including the proportions of all the Companies and Administrations concerned) for traffic the subject of this Agreement, and the tariffs for the time being shall not be varied except by mutual consent, due regard being had to the Companies' existing concessionary obligations to Governments in respect of cables over which such traffic is ordinarily transmitted. It is, however, understood that either of the parties hereto shall be at liberty, when collecting from the public to charge such an equivalent in local currency as to enable it to pay over the balances in gold francs is provided for in Article 9. In case the rates between Europe and China are reduced by mutual consent without such reduction being caused either by a rate war with a possible competing line or lines, or by the parties hereto obtaining compensations such as subsidies, guarantees or otherwise, then the rate between the Netherlands and the Dutch Indies, via India and Russia, is to be reduced proportionately, subject to the consent of the Russian Government as to the latter route. 8. Any messages handed over by either of the parties hereto to the other party hereto, shall be transmitted. at rates which, if not otherwise agreed upon, shall not exceed the ordinary rates of the cables or lines for such messages, together with any outpayments which it may be necessary to make to Companies or Administrations who are not parties to this Agreement. 9. True and proper accounts of all receipts and payments in respect of all traffic dealt with by this Agreement shall be kept by each party, and these accounts shall be open to the inspection of the officers of the other party, and the accounts shall, unless otherwise agreed between the parties hereto, be rendered in London quarterly to the Extension Company on behalf of both parties hereto, and the balances payable by or to each of the parties (unless otherwise agreed) shall, within four months from the end of each quarter, be paid in London to or by the Extension Company in sterling at the fixed rate of exchange of 25 francs to the £, or at the exchange of the day if preferred by either of the parties hereto. 10. Each party hereto shall strictly respect the "vias" designating the routes of the parties hereto on all messages transmitted by its lines. Neither of the parties hereto will directly or indirectly allow any rebate, commission, or other advantage in respect of the messages which are the subject of this Agreement, nor without the consent of the other party hereto combine or do any act for the purpose of directly or indirectly competing for traffic the subject of this Agreement. 11. 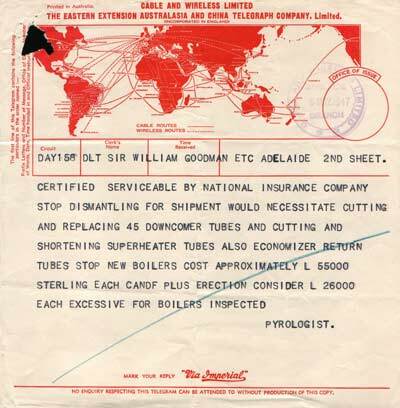 Having regard to the difficulties and risks attending the repairs of deep submarine telegraph cables, it is agreed that the parties hereto are not to come under pecuniary responsibility one to the other of them in relation thereto, but, subject to this qualification, it is hereby agreed that each of the parties hereto shall use its best endeavours, to maintain its cables or lines in efficient working order; and if any cable or line of either of the parties hereto shall be incapable through interruption of transmitting messages in the ordinary course of business, the Company concerned shall, with all practicable despatch, use its best endeavours to restore such cable or line to efficient working order. 12. Any of the lines of the parties hereto shall be deemed to be interrupted when the party whose lines are so interrupted cannot show that it has been able to transmit during twenty four consecutive hours traffic subject to this Agreement offered for transmission. 13. If the German Dutch Company extend their cable westward, the tariff proportion of the new cable on the traffic subject to this Agreement carried by such cable shall be included in the Joint Purse. PROVIDED ALWAYS that if the westward cable is used by any of the parties to the Pacific Joint Purse Agreement for the diversion of traffic intended for transmission by their own lines, then the said cable shall be entitled to retain such payment for transmission, such payment being made by the Company or Administration diverting, for its own account. PROVIDED ALSO that after the 1st day of January, 1916, 50 per cent. of the tariff proportion belonging to the new cable for the traffic in question shall be retained by the German-Dutch Company. 14. Subject to Article 6 hereof, this Agreement shall take effect and continue in force for the term of nineteen years from the date when the German Dutch Company's said line of submarine cables between Shanghai and Guam, via Yap, shall have been laid and opened for traffic, and thenceforward until one calendar year's written notice determining this Agreement shall have been given by either party to the other. 15. Differences which may from time to time arise between the parties hereto in anywise relating to or arising out of this Agreement or the subject matter thereof. shall be referred to arbitration, and such arbitration shall be subject to the provisions of the Act of the British Parliament known as the Arbitration Act, 1889, or any statutory modification or re enactment thereof . Unless otherwise agreed every such arbitration shall be held in London. IN WITNESS whereof the Eastern Extension Australasia and China Telegraph Company, Limited, has hereunto caused its Common Seal to be affixed, and the Deutsch-Niederländische Telegraphen Gesellschaft, AlktiengesellSchaft, by its authorised representatives, has appended its signature hereto the, day and year first above written.